On a recent day in March, a frigid winter in Calgary almost (almost, almost) behind us, the city’s downtown pedestrian mall was transformed into a wind tunnel. Stephen Avenue, a stretch of road blocked off along 8th Avenue, is easily one of Calgary’s most vibrant streets. Between 6 a.m. and 6 p.m., it is blocked off from traffic and home only to pedestrians or cyclists, acting as a lunch spot for office workers nearby and an after-work drinks spot for everyone else. When it is cold, there is no huddling; only hurried walking. You can watch spring arrive on the cobblestones downtown. Stephen Ave is Calgary’s Fußgängerzone—a shopping hub mostly, a gathering place with bus stops and benches. Like in Germany, it has been blocked off in the downtown core, along one of the oldest streets in this new town, and it gives pedestrians free-reign. Sometimes there are light shows or art exhibitions, in good weather along the cobblestones. Blocked off from traffic in the 1970s (20 years after the first one appeared in Kassel, and an era in which almost everything in Calgary was set in stone), it’s now a designated historical site. During the day the heritage buildings are blinded with clear prairie light, and at night you can stumble along from bar to bar. 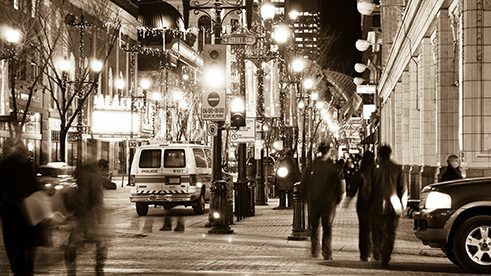 There is a certain amount of posturing here—with no place to “see and be seen,” in Calgary, Stephen Ave is at least a place to pretend. Still, a pedestrian zone in Calgary exists in opposition. This is a car city, home to thousands of them clogging the arteries while a half-empty CTrain zooms past. Right now our streets have literally become the battlegrounds of a self-labeled changing city. Mayor Naheed Nenshi and his council have been locked in debate surrounding a proposed bike lane track through the downtown core (counterpoint: a study has shown that it would slow commuter traffic by 30 seconds.) Recently a debate played out on a colleague’s Facebook page—could Stephen Ave play home to a weekend farmer’s market? Should it? Is there enough parking for people to drive downtown on their day off to buy vegetables? The market would be one block south of the city’s public train line. Stephen Ave. was named for Canada Pacific Railway’s first president George Mount Stephen—transportation, fast and luxurious, is a part of our history. Thus it makes sense that one of Calgary’s only and truest pedestrian havens was built in the name of a railway baron, and doesn’t stretch as far as it should. The other walkers’ paradise, a chunk of island in the middle of the Bow River known as Prince’s Island Park, is truly magnificent—in the summer, at dusk, it has bewitching qualities. This is Calgary: natural world that stuns, a philosophical aversion to the bipedal.